Build a custom railing system with these sturdy components. 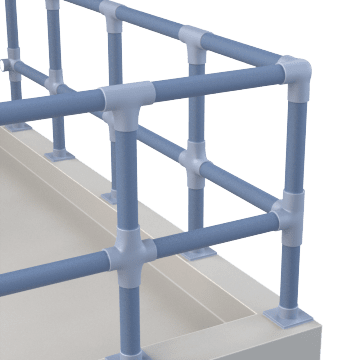 Modular pipe railings can be used to form continuous barriers in a variety of locations, such as between walkways and equipment, or near ledges and drop-offs. Join these lengths of pipe with the appropriate fittings to build a custom railing system for your workplace. 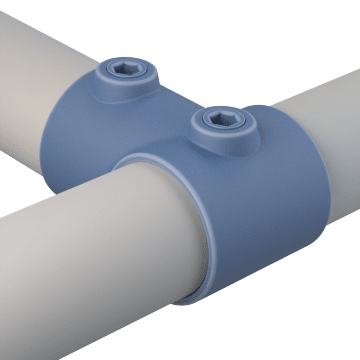 Mount a pipe to a flat surface such as a floor or a wall using these flanges. They connect the pipe to the surface at a 90° angle. 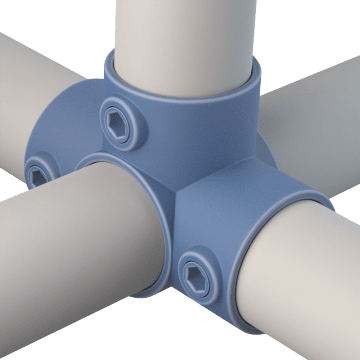 Designed to mount to a flat surface such as a floor, these flanges can be adjusted to connect to pipes at different angles. 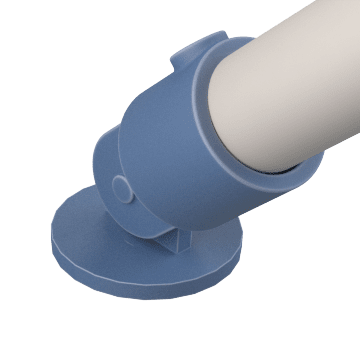 Join an upright post to two horizontal rails using these fittings. 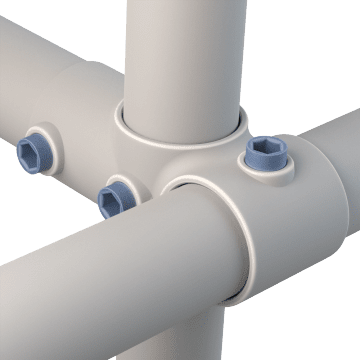 The fittings slide onto the upright post and one of the horizontal rails to form a 90° crossover joint, and they have a socket that connects the second horizontal pipe to form a 90° tee joint. 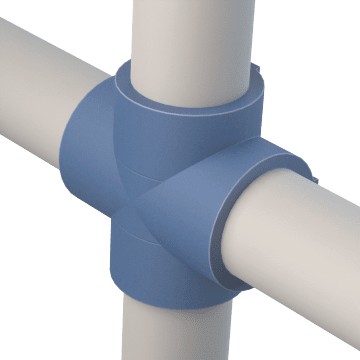 Tube-shaped couplings connect two pipes in a straight line. 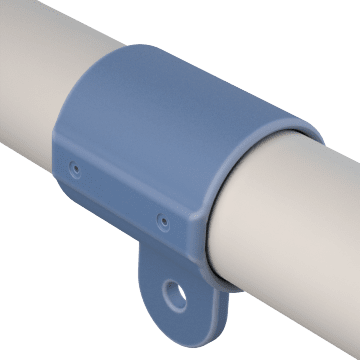 Pass a horizontal rail through the center opening on these fittings and insert a pipe end into each of the fitting's three sockets to connect them to the horizontal rail at 90° angles. 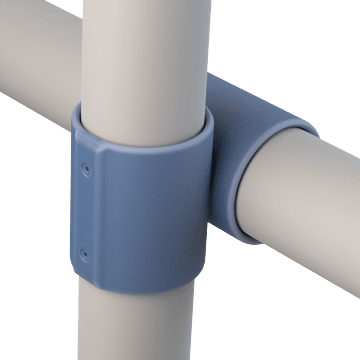 Connect four horizontal rails at 90° angles and join them to an upright post with these cross fittings. Slip these crosses onto an upright post and connect two horizontal pipes to the sockets. 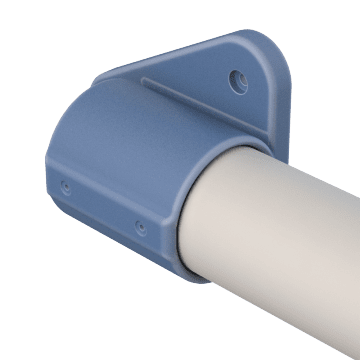 Ideal for building sloping midrails, the sockets adjust to connect to pipes at a range of angles. 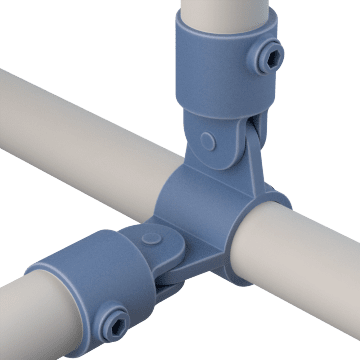 Connect two horizontal midrails to an upright post at 90° angles with these fittings. 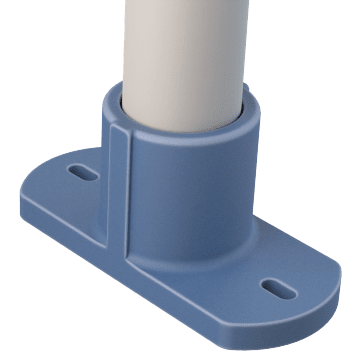 The fittings slide onto an upright post and have two sockets for connecting two horizontal midrails. 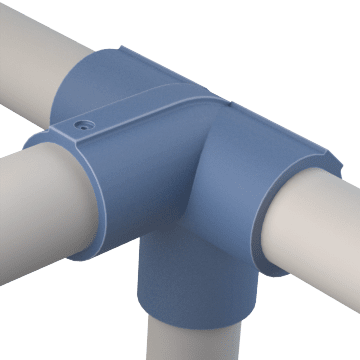 Create a 90° crossover joint in your pipe railing system using these U-shaped fittings. 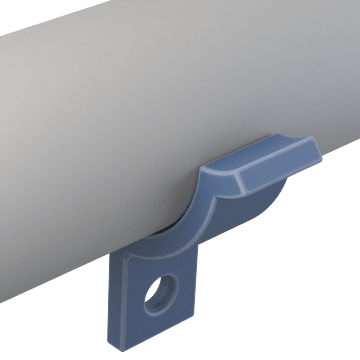 Install the fitting on an upright post and pass a horizontal rail through the fitting's holes to secure it to the post. 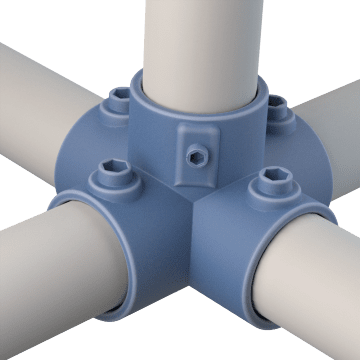 Make a simple crossover joint with these fittings. They slip onto an upright post and a horizontal midrail to join them at 90° angles. 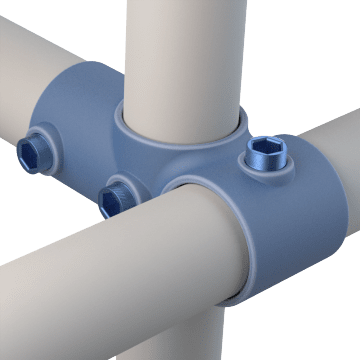 Typically used to connect a horizontal top rail with an end post, these fittings join two pipes at a 90° angle. 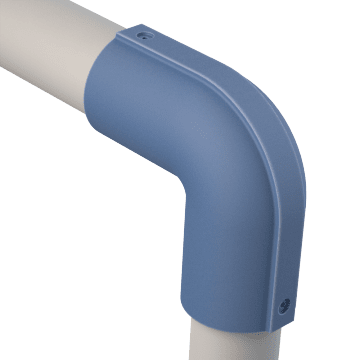 You can adjust these elbows to connect two pipes at a range of angles. 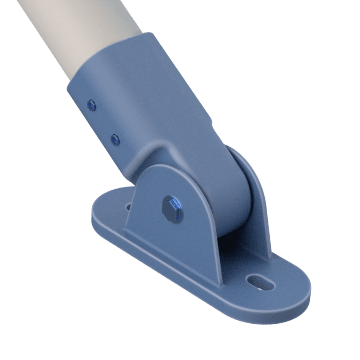 They are commonly used for connecting a slanting horizontal top rail to a vertical end post, such as on a stairway. 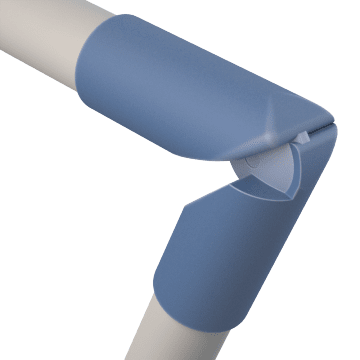 Create a 90° corner joint between two horizontal top rails and an upright post using these elbows. Equipped with three sockets, these tees can be used to join two horizontal top rails to an upright post at 90° angles. 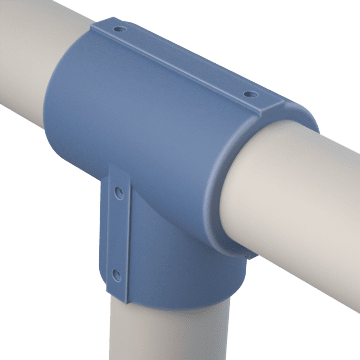 These fittings slide onto a vertical post and have two sockets that swivel on the post to connect the horizontal rails to the vertical post at a 90° angle. 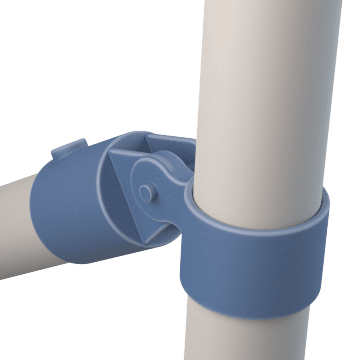 Use these fittings to join an upright post with three horizontal top rails at 90° angles. Form a 90° tee joint between a horizontal top rail and an upright post with these single-socket tees. 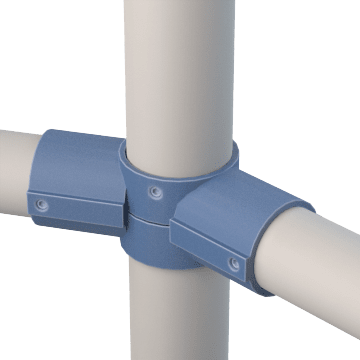 These fittings slide onto a vertical post and have two sockets that swivel up and down to connect to horizontal rails at a range of angles. 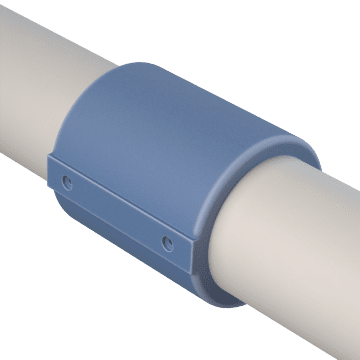 Slide these tees onto an upright pipe and connect a horizontal rail to the single socket. The socket adjusts to connect to pipes at a range of angles. 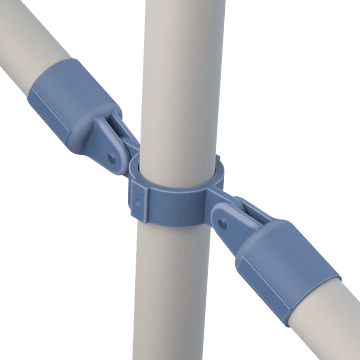 Suitable for connecting sloping midrails to an end post. 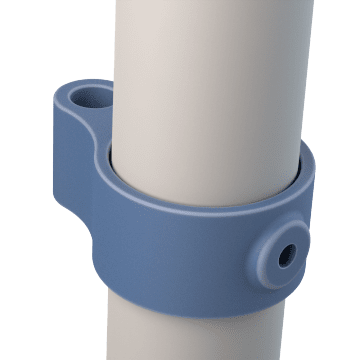 Securely attach a horizontal pipe railing to a wall with one of these flanges. 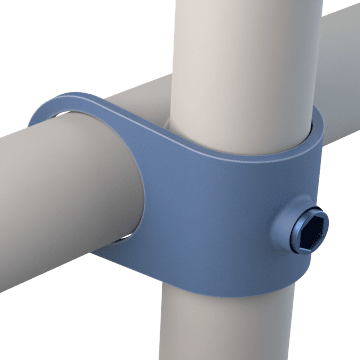 These adjustable flanges pivot to allow pipe railings to be mounted to a wall at a range of angles. 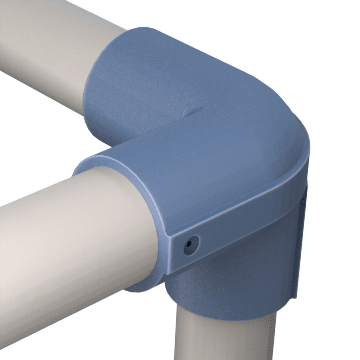 Mount these fittings to a flat surface to provide extra support for pipe railings. Insert a pin into the hole on these eye fittings to attach a swinging gate. The fittings slide onto an upright post. 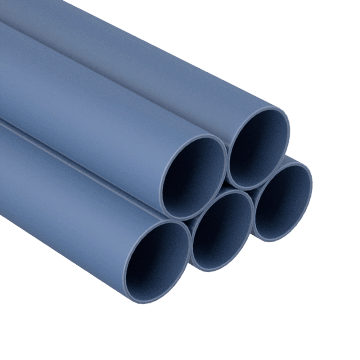 Attach panels and shelves to pipes with these fittings. 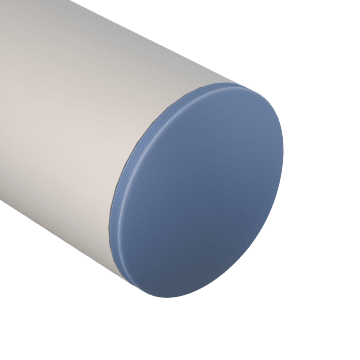 Seal pipe ends with these plugs to create a finished look and prevent the pipe ends from snagging or scratching hands or equipment. Find replacement screws for fastening fittings to pipe railings.